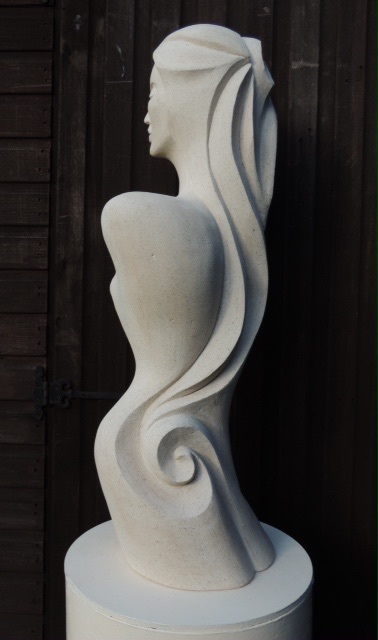 My Sculptures embody the feminine, her moods, sensuality, purity and charm. Elements of nature are apparent within the forms and limbs often become origins of a flowing line or swirl. 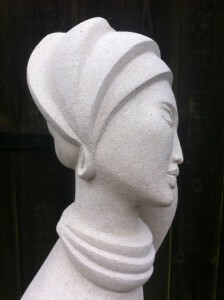 For me, carving in stone heightens the organic nature of my designs. There have been no definable influences on my style only my own growth and awareness. Because of this my designs are constantly changing and evolving. Simplicity. curves and the flow of the line are now my focus, however, to capture the female and her ‘inner being’ in her many emotive states has always been my inspiration and motivation. I studied in Sussex gaining a BA Honours in Art & Related Arts and then in Oxford where I obtained a Post Graduate in Art and Design Education. Always looking for outlets with which to express my creativity, I spent many years travelling and working with a combination of the visual arts, teaching, health & fitness and the healing arts. I have had some amazing experiences along the way and always benefited greatly from the opportunities that were given to me. I found my love of stone carving several years ago starting out with a handcrafted stone. This special medium was a hands on process from start to finish. Firstly the making of the stone (a variety of specialist sands, minerals and caen limestone or marble), the carving (done with a variety of hand tools) and to finish the sanding. I now focus on beautiful quarried stones that I’ve sourced globally, but continue to hand carve each piece. Every sculpture is unique and hand carved.